Feeling much better now in the swim and bike. Run, run, run... not really happening. My friend Steph borrow me her Buoyancy Belt and I tried water running. I have to say is kinda intense. Unfortunately I could just use it once on the past week. This upcomming week I will tried it to use it more often! Great way to start the week! On Saturday, I woke up at 5am to catch a glimpe of the Women's Olympic Triathlon and then jump to another mega brick of 70 miles. This time my coach asked to do a 30 min walk after the bike ride. In my mind walking is insulting... "I'm a triathlete, I'm an Ironman! ", so I tried jogging. I still felt the pain inside my ankle, but to a certain extent is tolarable. Still I had a backlash of messages to keep on theraphy and do what the PT says. I guess I'm getting close to recovery but not there yet. Crazy photo finish in the London's Women Olympic Triathlon!!! 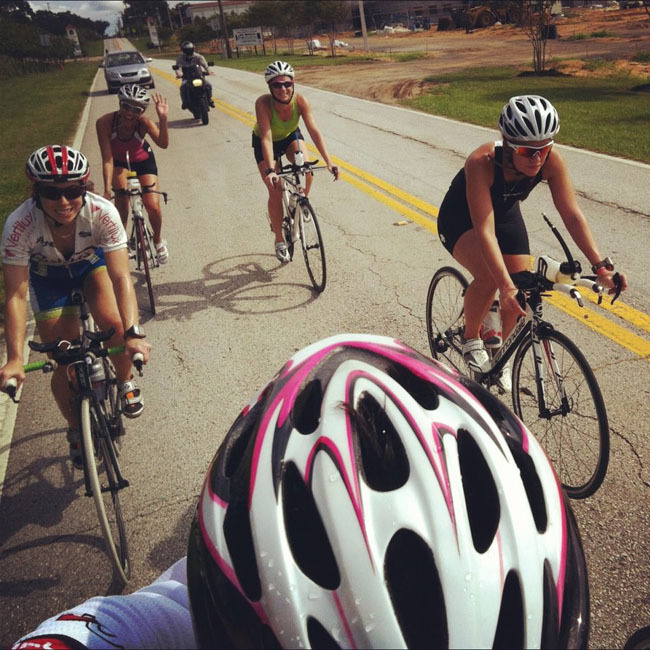 The same day, our team depart to Clermont, FL to train on Sunday on the hilly course of the city. Since Miami is flat like a pancake, and some of my teammates are going to compete in the USAT Nationals in Vermont in 3 weeks, which is a hilly course, seem like a perfect choice for them. Kona is a tough bike course, so of course I took advantage of this opportunity to go with them. The girls of the group having fun with our SWAG Mike on the motorcycle on the back. Needless to say, we had a blast!!! Still beat up from the early morning training, driving 4 hours, and jumping for 46 miles on the hills of Clermont... I thought I couldn't make it, but thankfully with the support of my awesome Tri-2-One group, the trip was a breeze! Full of fun and great time! We even had our own swag, Mike, which in his motorcycle he was guiding us through the hilly course. Thank you so much Mike! After attacking the Sugarloaf Mountain! SWAG Master Mike, me, Gene, Andrew, Juju, Ori, Ola and Brenda. Keeping positive and trying to recover fast! Can't wait to run again!! !